Skills and Abilities: Trained in unarmed combat by Storm and Wolverine. 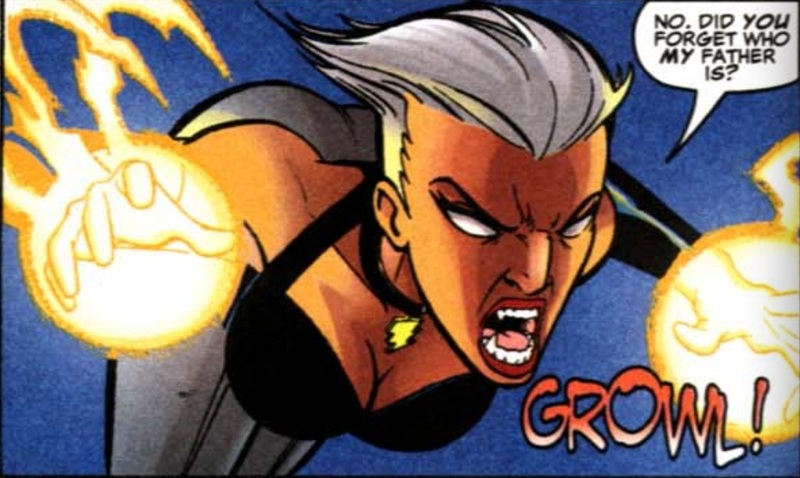 Powers:She has her fathers and mother’s powers. Enhanced senses and healing factor as well as baseline feral traits along with her mothers control of the weather for flight, electricity and wind projection ect. Kendall Logan is the first of two children born to Wolverine and Storm on earth 9811. In her world the heroes never returned from the secret war. She was trained in the use of her powers by Prof-X who was now using the Iron Man armor for mobility and life support. Her Mother and Father trained her in unarmed combat. When Dr. Doom’s son decided to conquer their world she joined with the children of the other Avengers to defeat him. When they discovered a way back to earth they left their parents behind to check if it was safe for them to return. What they found was a world overrun and destroyed by the mutant hunting Sentinels. As the Next Generation of Avengers they took it upon themselves to save the world. She and her team later reappeared during a battle with Kang at the end of time. Physically she is a mix of both parents, she’s as short as wolverine but her hair color is the same as her mom [What If…? #114, 1994].